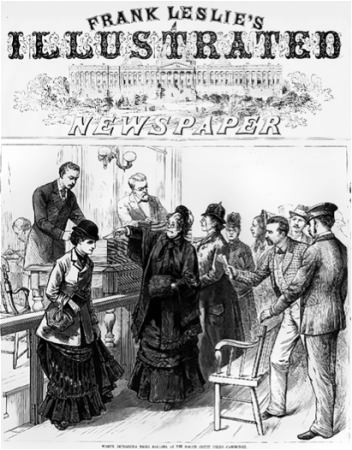 Frank Leslie’s illustrated newspaper captured the sketch of women exercising their right to vote for the first time. It was published Nov. 24, 1888. Frank Leslie’s Illustrated Newspaper, later renamed Leslie’s Weekly, was an American illustrated literary and news magazine founded in 1852 and published until 1922. Publisher and illustrator Frank Leslie provided weekly illustrations and reports of many historical news events including John Brown’s raid at Harpers Ferry and the Civil War, Spanish-American War and the First World War. Learn more about Frank Leslie.